Home » INCIDENTALLY DETECTED TRANSITIONAL CELL CARCINOMA IN A NONFUNCTIONING KIDNEY: SHOULD WE RELY ON RADIOLOGY? Primary transitional cell carcinoma (TCC) of the renal pelvis is a relatively rare disease accounting for less than 1% of the genitourinary neoplasms.1 Incidentally detected TCC of renal pelvis in a nonfunctioning kidney associated with staghorn calculi have rarely been reported.2 Herein, we report a case of incidentally detected histopathologically proven case of primary TCC of renal pelvis in a nonfunctioning kidney associated with staghorn calculus. This 45-years-old, male patient presented with pain in the left flank for last 2 months, with no history of other significant complaint except low grade recurrent fever and malaise. Examination revealed a visible lump in the left loin region, which was ballotable. Complete hemogram, serum biochemistry and renal function tests were within normal limits. Ultrasound examination found left nephrolithiasis (a staghorn calculus) and gross hydronephrosis. 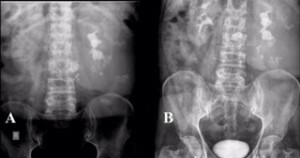 Intravenous pyelogram revealed non-excretion of contrast media with staghorn calculus in left kidney (Figure 1). Figure 1: Intravenous pyelogram of the patient showing non-excretion of contrast media with staghorn calculus in left kidney. 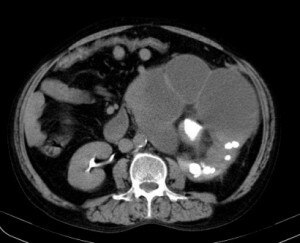 Contrast enhanced computerized tomography (CT) of urogram, in addition revealed left pyonephrosis and non-excretion of contrast media (Figure 2). Figure 2: Computerised Tomogram showing left hydronephrotic kidney with non-excretion of contrast medium. The glomerular function rate as detected by the diuretic DTPA renal scan was 6 milliliters per minute, with 5% on left side and 95% on right side. 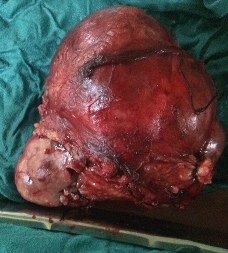 Left nephrectomy was undertaken in view of pyonephrosis. Postoperative gross pathological examination showed that the kidney was markedly enlarged with marked dilatation of the pelvi-calyceal system and thin residual renal parenchyma (Figure 3). Figure 3: Kidney specimen (gross) showing marked dilatation of the pelvi-calyceal system and thinning of residual renal parenchyma. A staghorn stone and multiple small calculi were identified in the dilated calyces. On cut section 3 centimeter frond like growth was present in the renal pelvis. Histopathology of the specimen showed transitional cell carcinoma. The metastatic work-up was negative, and hence he was finally diagnosed to have TCC, stage I (pT1N0M0). The patient had uneventful course in the hospital and was discharged. There is petite reporting in the indexed English literature of the association of transitional cell carcinoma (TCC) and staghorn calculus in a nonfunctioning kidney.2 Most of the stone associated malignancies of renal pelvis are squamous cell carcinoma (SCC). Chronic irritation with superimposed infection is believed to induce squamous metaplasia and subsequent neoplasia in the urothelium, resulting in squamous cell carcinoma. The etiology of primary TCC of the renal pelvis is associated with chronic smoking, chronic use of laxatives, non-steroidal anti-inflammatory drugs (NSAIDs) such as phenacetin, and occupational hazards to organic chemicals. Due to cost restrains, it is impractical to perform MRI or 64 slice CT for every patient of hydronephrotic non-functioning kidney with renal stone. Thereby, it is prudent for the pathologist to carefully look for malignancy. Filling defects, delay in appearance in pyelogram or renal parenchymal thinning should raise a suspicion of renal pelvic tumors despite the absence of mass effects and preservation of renal contour, warranting further studies by MRI or biopsy from renal pelvis preoperatively. The high incidence of renal pelvic malignancies in a hydronephrotic kidney highlights the need for meticulous sampling of the renal pelvis by the pathologist in such specimens. Kirkali Z, Tuzel E. Transitional cell carcinoma of the ureter and renal pelvis. Crit Rev Oncol Hematol 2003;47:155-69. Yeh CC, Lin TH, Wu HC, Chang CH, Chen CC, Chen WC. A high association of upper urinary tract transitional cell carcinoma with nonfunctioning kidney caused by stone disease in Taiwan. Urol Int 2007;79:19-23. Ozsahin M, Ugurluer G, Zouhair A. Management of transitional-cell carcinoma of the renal pelvis and ureter. Swiss Med Wkly 2009;139:353-6. McCoy JG, Honda H, Reznicek M, Williams RD. Computerized tomography for detection and staging of localized and pathologically defined upper tract urothelial tumors. J Urol 1991;146:1500-3. Jain KA. Transitional cell carcinoma of the renal pelvis presenting as pyonephrosis. J Ultrasound Med 2007;26:971-5. Lee TY, Ko SF, Wan YL, Cheng YF, Yang BY, Huang DL, Hsieh HH, Yu TJ, ChenWJ. Renal squamous cell carcinoma: CT findings and clinical significance. Abdom Imaging 1998;23:203-8. Gillitzer R, Melchior SW, Hampel C, Pfitzenmaier J, Thüroff JW. Transitional cell carcinoma of the renal pelvis presenting as a renal abscess. Urology 2002;60:165. Grant DC, Dee GJ, Yoder IC, Newhouse JH. Sonography in transitional cell carcinoma of the renal pelvis. Urol Radiol 1986;8:1-5.